There is a chocolate store not too far from me that has the most amazing caramel apples. These apples are dipped in caramel and then covered with so many other delicious toppings such as chocolate, marshmallows, nuts, candies, and so much more. They are amazing! I have to restrain myself almost daily from purchasing and then devouring one of these myself while my kids are at school. These were the inspiration for these simple (and much cheaper) homemade version. The problem for me with buying or making caramel apples is that I have 3 kids who all think they need to have their own. So each gets their own and eats a few bites (all around the outside, of course) and then decides they are done. Who wants to finish off that apple? Not me! Slicing the apple before any toppings go on means that they have to pick up a slice and finish that one before moving on to the next. So, yes I feel these are healthier because my kids are getting more apple than they otherwise would. Okay, so I may just believe that to make myself feel better about eating an entire plate of these myself. 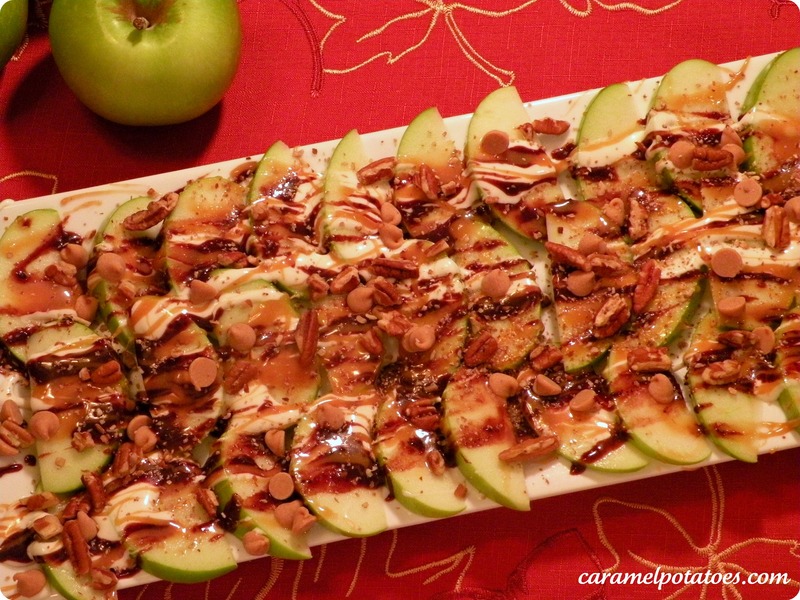 There are so many possibilities with caramel apple nachos. I have listed the ingredients we prefer but of course there are others. Just think…white chocolate, mini chocolate chips, rice krispie cereal, m&ms, etc… Let me know what your favorite toppings are! Slice apple and arrange on plate. In a glass bowl melt together the marshmallows and butter. Stir about every 30 seconds until smooth. Drizzle over apples. Drizzle chocolate and caramel sauces over the apples. Sprinkle peanut butter chips and nuts over the top. Serve immediately. **This is a messy, but tasty treat! Oh my gosh…I’ve got to try this!! On Nachos????? Oh my gosh! I can’t wait to try these!!! So simple, but so yummy! What a great idea. Might even get me to eat a bit more fruit. Sounds sinful. I am over from the Halloween Entourage Hop. Bookmarking this recipe. Thanks for joining our Great Halloween Link Up! Just wanted to let you know that we’re featuring this tomorrow (10/31) in our last round of party features. Be sure to stop by and grab a button! I have 4 left over granny smith apples and I was trying to think of what to make. Can’t wait to get off work to go home and make these! 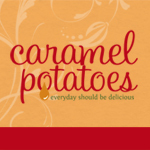 Good post, I’ve bookmarked ya on Digg under “Caramel Potatoes » Caramel Apple Nachos”. So hopefully our friends can give you a visit. Kudos for content!